The Hazardville Fired Department was created in 1893, but the need for this department became apparent years earlier. A look back at Hazardville’s unique history will explain why. Hazardville was named after Colonel Augustus C. Hazard, who developed a large gunpowder manufacturing enterprise along the Scantic River beginning in the 1830s. As the Hazard Powder Company grew, so too did the Village of Hazardville. By the 1890’s, the population had grown to an estimated 1,500, and the village featured numerous houses, barns and sheds, and business establishments. Farms, including several shade tobacco plantations, surrounded the village. Fire was a major threat, yet the only protection was from bucket brigades formed to fight them. In November 1892, as the result of resident concerns, state legislature petitioned to create a fire district. The Hazardville Fire Department was created by the Connecticut General Assembly the following spring. The first meeting of the Hazardville Fire Department, originally known as the Hazardville Fire and Hose Company, was held on January 11, 1893. Barber F. Stratton was elected as the first fire chief. Several years later, in 1897, a steam fire engine was purchased. 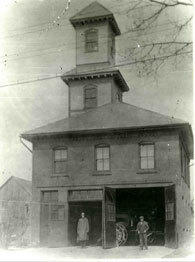 The first firehouse was constructed shortly thereafter, in 1898. The Department expanded its roster to 40 members in 1898 and, in 1899, purchased uniforms consisting of grey shirts and caps and white belts and gloves. By January 1900, the roster was full, and a waiting list for new members was instituted. It didn’t take long for the Hazardville Fire Department to prove its value to the community. Articles printed in the Thompsonville Press in 1904 and 1905 are among records documenting the firefighters’ prompt work in responding to major fires. The Fire Department also became well known for its annual Fourth of July celebration, which was initiated in 1905. The event featured a morning parade, followed by evening fireworks. In years to follow, the Fire Department continued to grow and prosper. The Company took delivery of its first motorized fire engine, an American LaFrance 300-gallon pump mounted on a three-ton Brockway truck, in 1920. This was followed by the acquisition of a Reo fire engine from the Sanford Motor Truck Co. in 1937. A fire alarm system, designed and built by Chief Raymond Smith, was installed in 1941 and utilized until 1959. In 1950, the American LaFrance/Brockway truck was retired from service and replaced by a fire truck built by the Howe Fire Apparatus Company on a Ford Chasis. Several other pieces of apparatus were purchased over the course of the next few decades, including a 1978 Mack/Baker 75-foot aerial scope. In 1957, a new firehouse was constructed behind the original, and the original firehouse was demolished. The station was upgraded in 1992, using grant money provided by the State. Today, the Hazardville Fire Department is a highly sophisticated public safety rescue system staffed not only by courageous and dedicated volunteers, but by nine full-time firefighters.